The polka-dot jersey (formerly Riccardo Ricco's) is not being worn today; the runner-up was Ricco's teammate David de la Fuente. 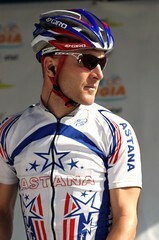 I'm not sure about the white jersey, which Ricco also held -- I'll keep an eye out for it. Baden Cooke is the latest Barloworld rider to abandon. He crashed about 10 miles into the stage, rode on briefly, but then left the race. There are 156 riders on the course, with the exit of Saunier Duval and Cooke. Samuel Dumoulin of Cofidis and Arnaud Gerard attacked at around 36 kilometers ridden, and have mostly been given their head, out to more than 4:00. A stiff tailwind has the average speed for the day up over 50 kms/hr. The gap has been coming down since the climb. Freire came out of the field and sprinted for the 2 points available at the sprint line. The leaders have 1:13 with 54 miles to ride.